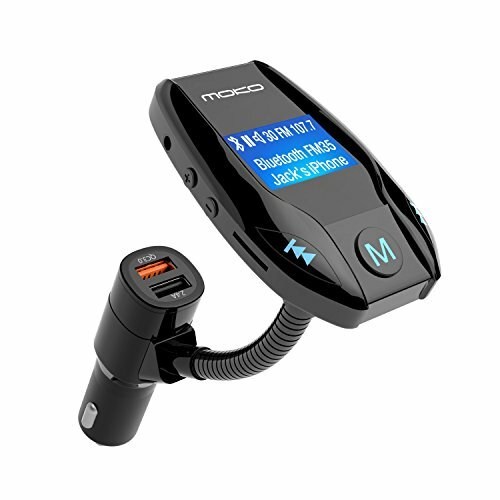 [Upgraded Version] FM Transmitter with QC 3.0 Port, MoKo Wireless In-Car Radio Adapter Audio Receiver Handsfree Calling Car Kit & 1.44'' Display Support AUX Input/ Output, TF Card, MP3 Player, BLACK by MoKo at Got Busted Mobile. MPN: 4332957546. Hurry! Limited time offer. Offer valid only while supplies last. Features: Hands-free Calling With this wireless device, you can conveniently answer/hang off/reject/redial calls through hands-free function. With this wireless device, you can conveniently answer/hang off/reject/redial calls through hands-free function. Output1: QC 3.0 USB charging port provides up to 18W (3.6-6.5V/3A 6.5-9V/2A 9-12V/1.5A) of charging power, which rapidly charge any smart phone that has Quick Charge enabled and up to 4X faster than traditional standard charging ports. Can rotate the LCD display screen in 270-degree gooseneck for optimal viewing comfort Easy Installation. Plug and play, easy to use. With Memory Function, once paired, it will automatically connect to its memorized paired devices when power on next time. 1.Plug it into car cigarette lighter socket, power on automatically. 2.Connect devices to the transmitter via Wireless or insert USB flash drive or TF card into the transmitter. 3.Tune your car FM radio frequency to a blank FM frequency. Then tune the FM transmitter into the same frequency with the car FM radio. INTELLIGENT AND FAST CHARGING: With 3 USB Ports Design: One USB Port is designed for reading USB files and the other two USB ports are designed for charging; The 2 Output USB Ports: Output1: The Orange QC 3.0 USB charging port provides up to 18W (3.6-6.5V/3A 6.5-9V/2A 9-12V/1.5A) of charging power, It can rapidly charge any smart phone that has Quick Charge enabled and up to 4X faster than traditional standard charging ports. Output2: 5V / 2.4A. HANDSFREE CALLING: With this wireless device, you can conveniently answer / hang off / reject / redial calls through hands-free function. GREAT SOUND QUALITY: Insert a TF card / USB Flash Driver or pair this FM transmitter with your digital device to enjoy music playback or hands-free conversation. High definition sound quality with Mic functionality, makes you enjoy soothing music or making calls with your friends freely. ROTATABLE LCD DISPLAY SCREEN: Can rotate the LCD display screen in 270-degree gooseneck for optimal viewing comfort Easy Installation. Plug and play, easy to use. With Memory Function, once paired, it will automatically connect to its memorized paired devices when power on next time. Easy Installation. Plug and play and easy to use. With Memory Function, once paired, it will automatically connect to its memorized paired devices when power on next time. WIDE COMPATIBILITY: Pair this FM transmitter with your devices, such as iPhone, iPad, iPod, and other Android Smartphones like Samsung, Sony, Huawei, Google, HTC or insert a TF card / USB Flash Driver to enjoy music playback or hands-free calling. It can play music files in the MP3, WMA formats on the TF card with a capacity of up to 32GB.